Special thanks to the folks over at FaveSouthernRecipes.com for this photo! 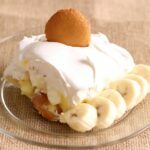 When it comes to Banana Pudding, the South reigns supreme and though there are TONS of recipes out there, this one is probably one of the most unique. This is a favorite at our house! Line the bottom of a large bowl with vanilla wafers. Combine pudding and marshmallows and spread over cookies. Slice bananas on top of pudding. Top with whipped topping and chill. this pretty much the way that i make it, except i never thought to add the marshmallows—will have to try them nest time! thanks. I’m not a huge marshmallow fan, but they really work in this! My youngest daughter loves to cook several years ago on a Sat. she brought a Banana Pudding over for her Daddy. 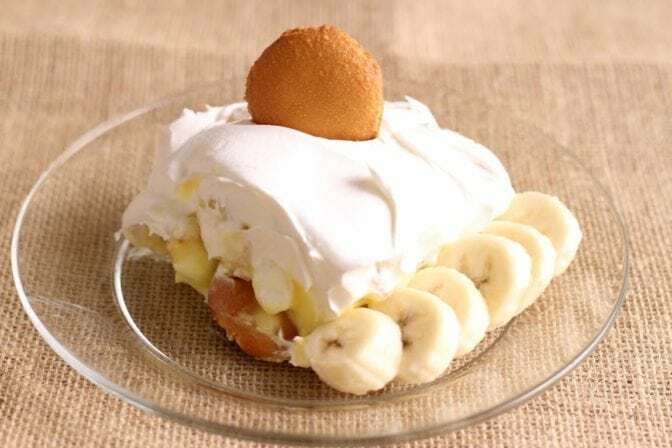 He took one bite and told her, he did not want to hurt her feeling, but until she learned to make a Banana Pudding like her mother, not to bring him any. From that day on, she made the Old Fashioned pudding where you cook the custard, using the Nilla Wafers and meringue. I found out in the late 1700’s and 1800’s cake was broken up and used along with the bananas, and the custard was either layered or poured over all the cake and bananas. I made Banana Pudding like that and the custard soaked into the cake. We did not like it, using wafers is much better. I do want to try baking some vanilla wafers some time. Enjoy your recipes. Margaret from the Old North State. One day when you are feeling a little adventurous try this pudding using PepperidgeFarm Chessmen instead of Nilla wafers. It is good out of all proportion to the little extra cost of the cookies! And sometimes I sneak in some Cool Whip rather than marshmallows. I LOVE Banana Pudding made with the Chessmen cookies! So good! Thanks for the reminder!